Very nice pub with a nice crowd - six ales on and the Trappers Hat in good condition - would come back - friendly. 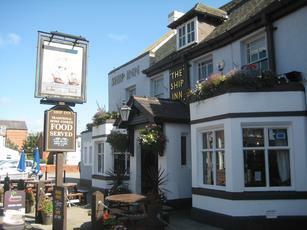 Another reasonably busy pub on the Wirral yesterday afternoon/early evening. This pub has a nautical theme, with a number of model ships and other maritime odds and sods. The beer range wasn't too inspiring - Bombardier, Deuchars, Landlord & Abbot. Although they do seem to have Trappers Hat on permanently too. Not a pub I'd rush back to. Although I have to give special mention to the toilets - I thought the gents were in particularly good condition and very clean. Revisited a couple of days ago and sadly the beer wasn't as good. The Trapper's Hat tasted stale and the Golden Pippin was more like Golden Vinegar. Third choice was Well's Bombardier which was ok and got better as the night went on. You have to question whether a pub should have 6 or 8 real ales if they can only look after 2 or 3 of them. Live Trad Jazz band was an unexpected bonus. Friendly staff and good beer (Brimstage "Trapper's Hat" & Skipton "Golden Pippin"). My first visit and not my last. Looks like they took note of my comments on the garden furniture - all new benches now to complement a general sprucing up out there. Very pleasant last week of a lunch when the weather was great and my Copper Dragon Best, Thwaites Wainwright and Betwixt Dark Matter beers were all very good. I'm wondering whether the pub has changed hands given that the marketing seems different?